Perusing this thread again while eating dinner (my wife's out of town) and the uncovering (and removal) of the I-695 sign prompts me to suggest that anyone interested in the remaining older signs in the District should try to see them sooner rather than later. 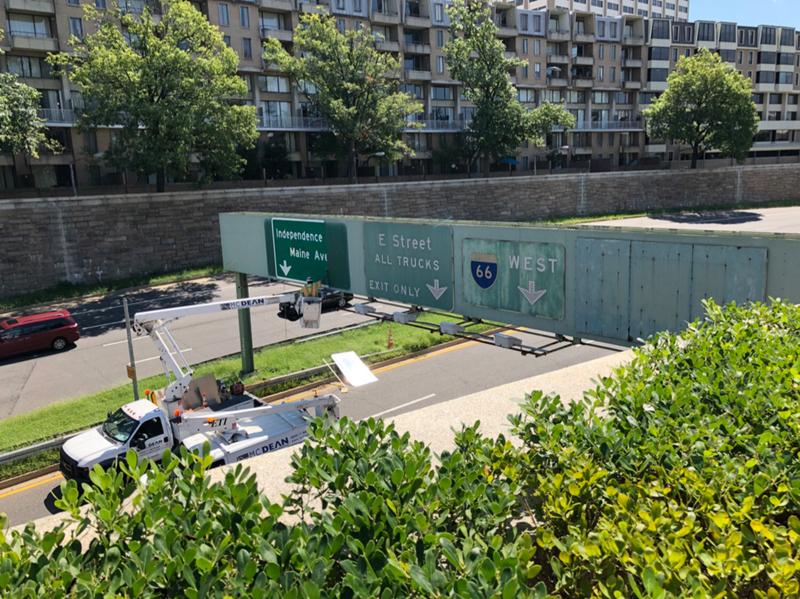 As of this past Monday afternoon, at least, the wall-mounted BGS with the I-95 territory-named shield located underneath the L'Enfant Promenade was still in place; that sign and its neighbor both also have unusual arrows. The two ancient LGSs on the 12th Street Expressway were still there too; I expect those might be the next signs to be replaced because they're really in quite terrible shape with the green peeling off in various spots. I asked Dave Dildine whether the I-66 project involved replacing the whole sign bridge or just the BGS(s), but he didn't respond. Don't know if I'll get over that way this weekend. I sometimes drive to work on Friday but haven't decided about tomorrow yet (and getting across town from the convention center area is a nuisance at midday anyway). Speaking of territory-named shields, BTW, it's interesting to see that long-lost I-695 shield was neutered. Back then DC signs often had "District of Columbia" spelled out in the "state" name spot. Mike Tantillo, a transportation engineer and road enthusiast, was not associated with the work but couldn’t resist stopping by to watch the operation from afar. 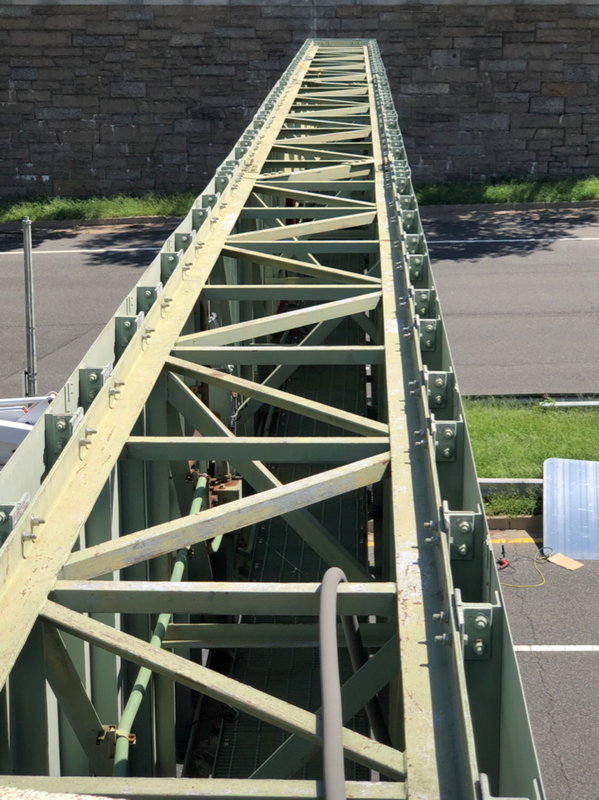 Situated in the middle of the structure, the two faded signs for I-66 and E Street have been pummeled by countless snow and windstorms over the years, but Tantillo said sunlight took a greater toll. 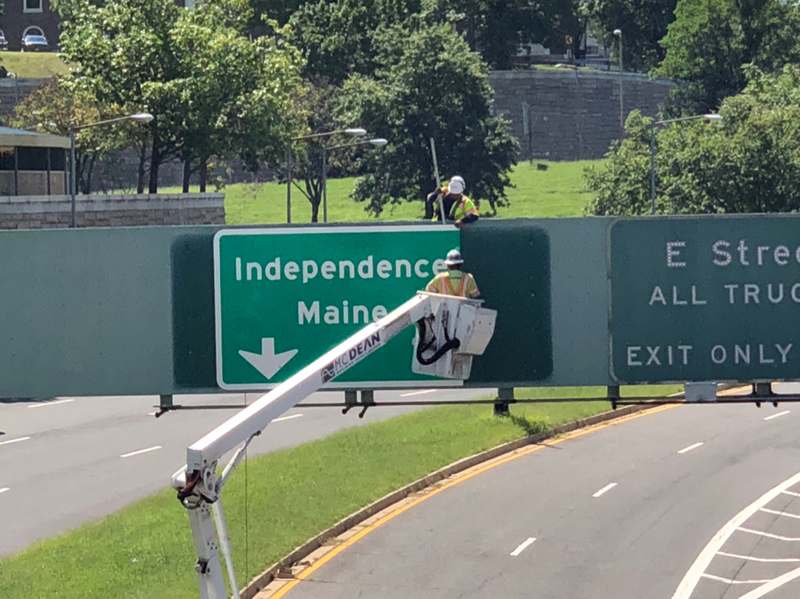 Tantillo, a traffic device expert, said that the signage could have exceeded its life expectancy since it faced north, away from the direct rays of the sun. “For signs to last 50 years – those are absolutely ancient,” Tantillo said. A full-scale overhaul of the District’s highway signs could be on the horizon. DDOT recently secured funding from the Federal Highway Administration for a project, currently in a procurement phase, that will evaluate and possibly revamp highway signage throughout the city to ensure compliance with federal standards. There's still some button copy left on I-395 and that paragraph suggests it's not long for this world. Can someone find the exact location of the sign on Google Maps Satellite View and post the URL? Here you go. I've dropped the pin slightly north of the actual sign bridge to make it easier if you go into Street View. Edited to add: Dave Dildine responded to my query about how they removed the sign. Sadly they pried the boards as they dismantled the sign in pieces â€“ the whole sign never saw the light of day in its entirety. Disappointing, but thankfully the plan calls for it to be reassembled and displayed in the sign shop. Interesting. That 0.4 mile of southbound roadway after the split to I-66 westbound is I-695 southbound to its end just south of Constitution Avenue. Likewise 0.2 mile of northbound I-695 was built south of the I-66 merge. Could have been signed as I-695 but probably not beneficial. But a short segment of I-695 was actually constructed. Was that smidgen of road ever actually designated as I-695 (presumably on paper, of course)? I’ve never heard of it having any designation other than the seldom-used “Potomac River Freeway,” but then I’m not old enough to remember the days prior to the bigger plans being cancelled. Of course, even if it did have the formal designation, having a BGS with an Interstate shield most likely would have confused people, and the way Ohio Drive and Rock Creek Parkway operate one-way outbound in the afternoon would have made it worse. Well, a few segments of I-695 were constructed, but yes this is one of them. I would say that it definitely was and is a constructed segment of I-695. I don't recall ever seeing any I-695 signs posted anywhere in D.C. before the recent designation of the 11th Street Bridge and the Southeast Freeway. Also some on the DC-295 frontage road southbound approaching Benning Road, N.E. Oh, no question it was constructed with the intent it become part of the ultimately-unbuilt highway. All I meant was whether it ever actually received any kind of formal number, recognizing that’s not necessarily an easy thing to determine with DC. That is, I’m thinking along the lines of FL-9B, which is intended to become I-795 but is not yet so designated. I was wondering whether the DC stub in question was to become I-695 someday upon completion of the never-built segment, or whether it was secretly designated I-695 from the start. I was wondering whether the DC stub in question was to become I-695 someday upon completion of the never-built segment, or whether it was secretly designated I-695 from the start. I don't know what DDOT specifically said back then, but I would say yes to both. The design shows that it was part of a future South Leg of the Inner Loop which was I-695. It was unposted with the route number. Changing the topic, I found this old photo that’s clearly from either the 1960s or 1970s. See if you can spot the road features that are no longer there and the major one that’s there now and wasn’t then. The stubs for the would-be Whitehurst widening, and I-66 itself? Both correct: Two ghost ramps (now removed) in the foreground would have connected I-266 to unbuilt I-66. 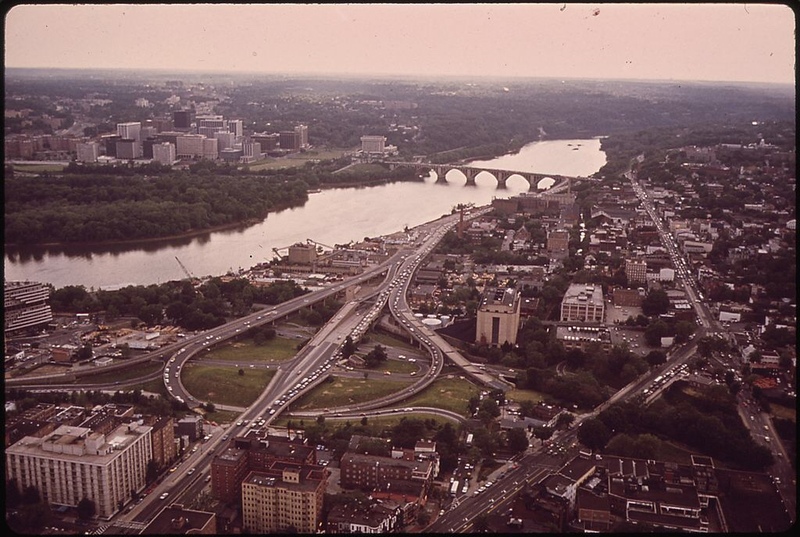 In the far left background, construction on I-66 in Rosslyn hadn’t even begun yet (the portion from there to I-495 opened just before Christmas in 1982). What interests me (almost) more is that it looks like they're putting the new signs on the same sign bridge. Guess they feel like it's still in good shape after nearly 60 years to handle new signs? I wonder if DDOT will update the lighting on the sign bridge. Google Maps and the WTOP photos shows the previously covered section had the lights removed. (because why illuminate a plywood covered sign?) Also, is the far right sign remaining covered or removed all together? The WTOP report just says it was for a closed exit, and is not being replaced. That they are! Photos taken about one minute ago. I got off work early and came over here. The “p” is slightly out of alignment. I suspect it’s an upside-down “d.” Edited to add: WTOP’s Dave Dildine just came by to say hello—I had tweeted him when I saw his vehicle parked nearby—and when I pointed this out to him, he agreed. He also laughed and said he wished I hadn’t pointed it out because now he’ll see it every time! The other two visible BGSs are to be replaced too, but they may not get to it today. 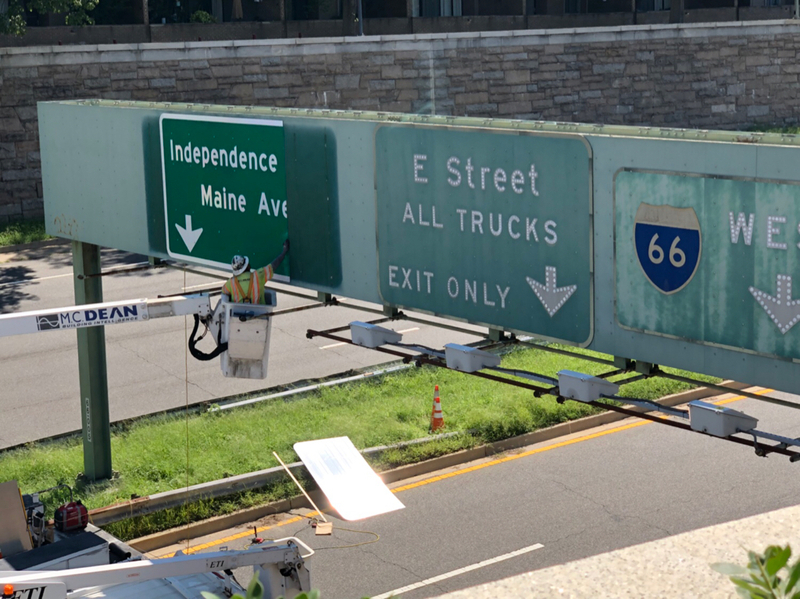 Dave said they had a LOT of trouble removing the I-695 sign because the bolts were severely rusted (no surprise at all after so many years out in the elements). Fully reflective signs shouldn't need lighting at all. But given the location coming out from under a dark overpass, maybe it'll be installed anyway. The one on the right would not be replaced but the 66 sign ought to be extended to include a destination. Were the Maine Avenue ramps from 395 considered 695? They're almost the same as the 66 split in terms of length. They seem to be taking a break, so I’m going to leave. I just took this for those interested in what the overall assembly is like from above. For such an old structure, it looks like it's in really good shape. No wonder they decided to reuse it. Also, that upside-down "d" in "Independence Ave" is hilarious. Hopefully this isn't a sign of DDOT catching the infamous Craig County virus. It's cool to hear that that I-695 sign will be preserved! Hope same thing happens to the I-66 sign on the right of the bridge once that's up for replacement. I wonder if they'll convert to mile-based exit numbers on I-395 or I-295 at all. It looks like they were starting to when I-695 was signed and then aborted the attempt. For I-295, I'd love to see a mile-based scheme unified with the short segment in Maryland (which would get rid of the exit 1 followed by exit 1 situation SB) and DC 295, though if one was to consider only the DC mileage, the numbers could easily be considered close enough and left alone. I suppose you could use milepost numbers on there, but it seems like it might require a lot of suffixing. Not sure it makes sense. I-295 might be more logical, especially if they unified it with DC-295 (I'm sure someone will be happy to tell us why they're not supposed to do that!). BTW, Dave Dildine agreed with my sentiment that it's a shame to see unique and interesting old signs disappearing, but I certainly agreed with him that some of DC's decrepit and misaligned signage can be a problem. We both dislike the signs on inbound I-395 because they've often been poorly placed (not necessarily aligned with the lanes) and crammed-in. He noted that many of DC's signs are not standard from one place to another and ought to be made consistent. I understand and agree with that in principle, although I lament that "progress" so often means the loss of what makes these things interesting. He definitely concurred that if you want to see DC's older signage while it's still there, get to the city now! Edited to add: One more comment—if you viewed his story yesterday, view it again. He's added more photos to the gallery. Here's the link again for convenience. The new photos include drawings of what will replace the E Street and I-66 signs.